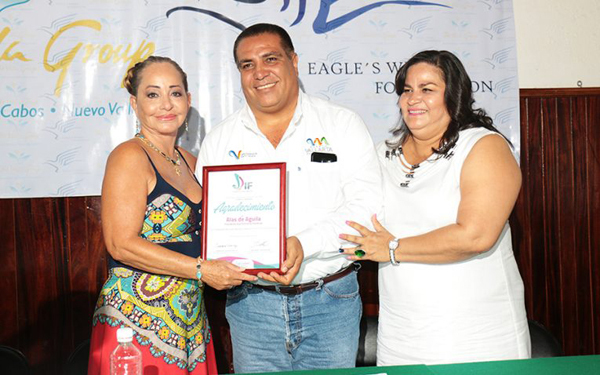 The mayor, Arturo Davalos Peña, and president of DIF Puerto Vallarta, Candelaria Tovar de Dávalos, witnessed the delivery of support that Eagle Wings Foundation awards annually to different civil associations in the region so that they can continue with their altruistic work in favor of those most in need. This year resources of 2,591,200 pesos were granted to 32 associations by the Eagle Wings Foundation with the support of Villas Group Resort, which was recognized by the Mayor and the President of DIF, since this large group consists of people committed to the welfare of Vallartans the municipal government has valuable allies to continue making Puerto Vallarta an Inclusive City, working for the most vulnerable. In giving recognition to the President of the Eagle Wings Foundation, Eva Contreras Sandoval, for the important work, Mayor Arturo Davalos highlighted the principles, values and commitment of those who make up this foundation, which provides yearly support to various organizations so that they can continue to provide care and ensure the welfare of families. It was further noted that each of the civil partnerships are key to the city "for altruistic work, all the work and enthusiasm that provide the support they have always given us; often the council can not provide the service that is provided and so thank you very much." Meanwhile, Candelaria Tovar de Dávalos urged the beneficiary associations to maximize the resources that were provided and reiterated the support Eva Contreras has given the DIF, since this time a donation was received by more than 200,000 pesos for the programs of the Mexican Association for the Comprehensive Family (AMSIF), Scholarships and Comprehensive Care Program Disability (PAID). "Thank you for every donation given us because they allow us to continue working with the United Securities Families (Familias Unidas con Valores). Especially today with this support we can continue to bring the program AMSIF providing support so more women who will have the opportunity to improve their self-esteem and learn activities that generate an income for their families. For our little ones we can provide scholarships through Becas and PAID so children can continue their studies and concentrate on getting good grades," she said. Some of the associations which received funds were: Becas Vallarta, Asilo San Juan Diego, Guerreros Contra las Adicciones, SETAC, Casa Hogar Máximo Cornejo, Torpedos, Piratas de la Bahía, Ayudemos a Vallarta, Clínica de Rehabilitación Santa Bárbara, Refugio Infantil Santa Esperanza, Puerto Vallarta Library, Mamás Unidas for Rehabilitation, Food Bank, ANSPAC, Horizonte de Paz, and Dives In Misericordia. The event was also attended by the Chairman of Inspection and Surveillance of Eagle Wings Foundation, Juan Carlos Rios; the Directors of Eagle Wings, Sara Cardona and Cesar Sanchez and representatives of 32 benefiting civil associations.